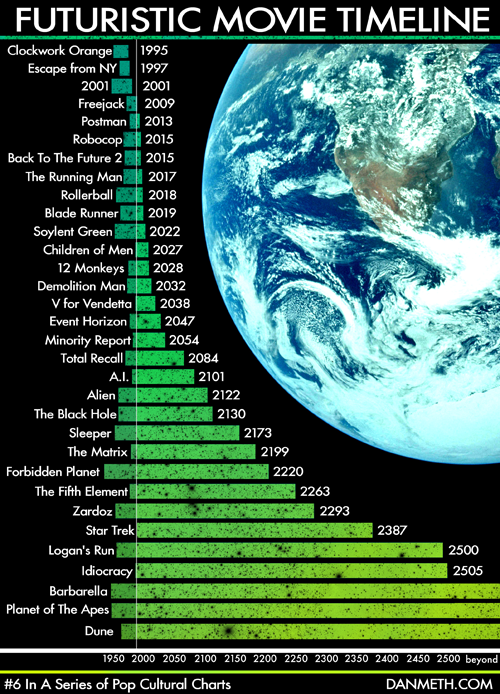 So on the one hand, we only have 73 years to colonize Mars, but we have 250 years to get ready for the arrival of the Great Evil and the return of the Fifth Element, and almost five hundred years to prevent Idiocracy from happening. via Science Fiction Timeline | The Mary Sue. My childhood was defined by a lot of these movies (or really books, in the case of Logan’s Run). We’re pretty close to Running Man and RollerBall however, and that excites/scares me in a way. I distinctly remember the day I realized that certain ‘dates’ in books and movies had passed by. Like try to sort out when Judgement Day is in the Terminator timeline. Or when the SDF-1 crashed (Macross Saga). In a lot of books from the 70s and 80s, World War III happened in the 90s.